I watched a hard science fiction movie recently by the name of Moon in which Sam Rockwell is the lone human operator at a lunar mining operation that harvests energy to meet earth’s energy needs. 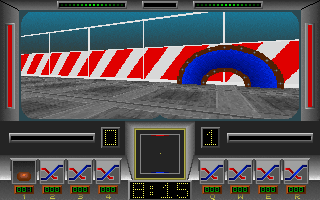 The movie reminded me heavily of a game from Sierra that I had always wanted to try named Outpost. So I tracked down the game on eBay (along with a few other fluffy titles that will show up on this blog eventually). The game is already in MobyGames, but not with very many screenshots. 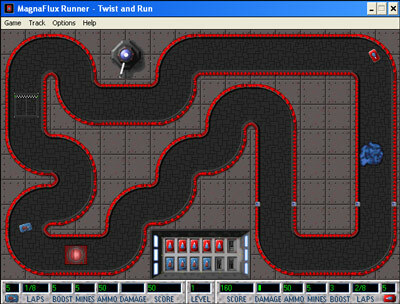 Unfortunately, I could not make the game run in Windows XP. 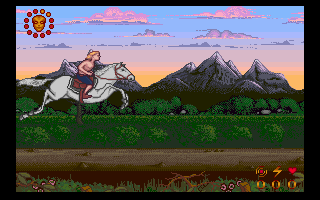 I was able to capture the above screenshot using a separate movie player — the game uses many FLIC animations, one of the oldest of the old school animation formats. But does not do anything else, aside from playing a sound. It should be noted that the usual Windows compatibility hacks were fruitless. So, all in all, a disappointment… or was it? The game comes with a 120-page manual in PDF format. While interesting and well-written, it’s also very long. Playing this game would have been a significant time investment, not unlike attending a class on a subject that won’t be particularly useful throughout your life. At the risk of sounding elitist, the more I read through the manual, the more I felt that I should be putting my vast intellectual resources to better use (there are at least 1/2 dozen unentered Barbie games, for example; or maybe even something completely unrelated to gaming). According to the MobyGames trivia entry, this game was once awarded “Most Brutal Customer Stultification in 1994” by a gaming magazine. I took a brief vacation a little over a month ago. It was the kind of vacation where I, you know, actually traveled somewhere that was a significant distance from home. And what did I think to do? Play games, of course. Not all the time, fortunately, but during certain downtime. 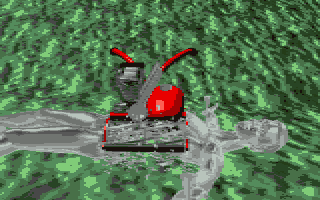 I took my little ASUS Eee PC 701 loaded up with DOSBox and the ripped ISO images of most every DOS game from my collection still unentered into MobyGames. Executive Summary: None were good. Surprised? 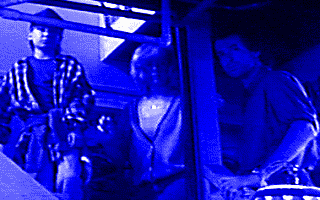 In 3D Cyberpuck, set in 2212, people have channeled their lust for violence into an ultra-violent version of hockey. 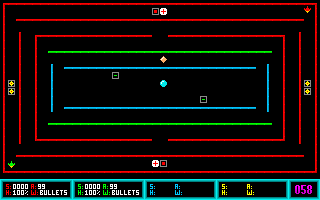 The point of the game is to hit the goal but there are also lots of weapons and powerups that come into play. I scored a goal though I am at a loss to explain how. I used my digital gamepad that I thought to bring along for the trip. However, this game was obviously designed for an analog joystick. If you have ever experienced that kind of mismatch, you know how impossible a game can be. Next up is Megamaze. This is a game that requires at least 2 players and at most 4, so it’s a little tricky for just one person to try. Actually, it would also be rather difficult for the maximum 4 players to play simultaneously since all 4 are expected to use the same keyboard. 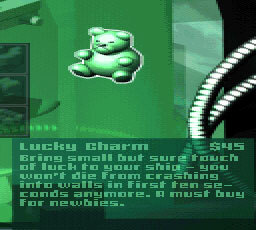 The players simply roam around the maze and shoot each other. 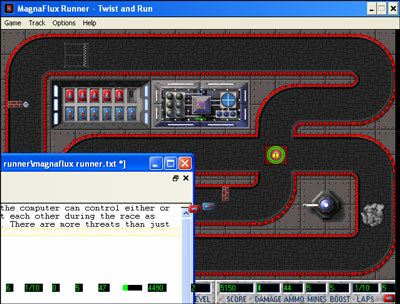 The game was made by 2 fairly young-looking programmers, neither of whom took credit for the sound. My notes indicate that the sound was rather lacking (and the sample from the game over screen was clearly taken from “Aliens”). Somehow, I feel I can’t be too hard on the game since I made a similar game around the same time. 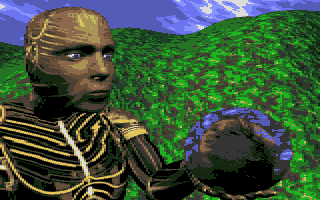 I tried Xerix II: The Caverns of Mars which, despite being freely available, is not in MobyGames. Maybe others have tried it but, like me, couldn’t get it to run. Klondike Moon is one of those games that just goes clear over my head. It has something to do with outer space mining. According to my notes, you win a level when you pay off your debt, exit through the wormhole, and block others from making good on their debts. The more pages that an instruction manual contains, the quicker I lose interest, unfortunately. I’m not looking forward to combing over the manual again in order to create a satisfactory MobyGames description. 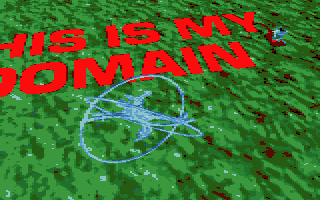 It’s hard to believe this came on a CD-ROM (obviously a re-release). This probably would have been a halfway fun action game except for speed issues; I couldn’t make the game run slow enough. Either that or there were input timing issues so that I couldn’t control the character effectively. At least Tower of Fear came with some interesting demos. 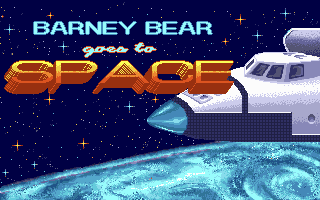 Now this sounds like it would be more up my alley: Barney Bear Goes To Space. One last game I tried was Absolute Zero, which is already in the database but without any appreciable action screenshots. 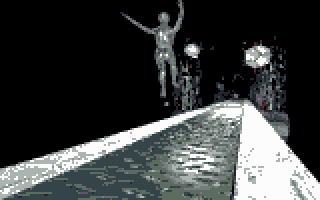 When I tried to play, I realized that the the contributor who submitted the original screenshots probably encountered the same problem I did: the FMV transition segments ran too slowly. When I say “ran too slowly,” I mean on the order of 1 frame per second rather than, say, 15. I got as far as this news segment setting up the story with the headline, “Security Charged With Brutality.” You’d be angry too if you had to deal with this computer system. I would hate for March to transpire without a single entry (when I sat down to write this, I had honestly forgotten that I had already logged one post this month, but I am sort of committed to this evening’s gaming now). So here I am, again, at the very last minute. Hey, I think I’ll even resolve to springboard over the 10K mark on MobyGames tonight. May as well since I’m only 15 points away from the symbolic marker. That’s only 7 1/2 screenshots. I think the reason I have been putting this off for so long is because I haven’t had time to prepare my 10K acceptance speech. It’s a good day to play a game because I just got a new shipment in from an eBay seller. That’s right! I’m still accumulating games from eBay sellers. That’s not as strange as the fact that I found a seller from whom I was able to order over a dozen games, many of which were not in the database yet. 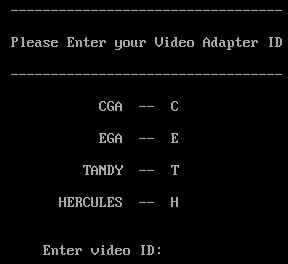 Many of these are old DOS games from the early-mid 1990s, some were later re-released on CD-ROM. Here’s one that is already in the database but only had 2 screenshots: Wrath of the Demon. The reason it interested me is that the person who submitted the 2 screenshots claimed that he couldn’t get far enough into the game to gather anymore screenshots. I’m pleased to report that I was able to collect a few more, but mostly because I remembered to capture things like story screens, game over screens, etc. 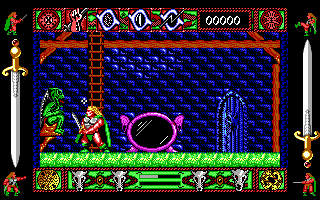 I think this is actually a darn good game by 1990-1991 PC action game standards. 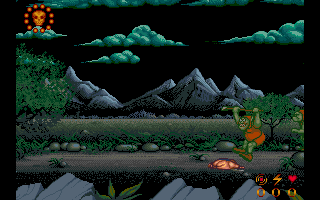 At least, it excels in the audio/video departments with its parallax side scrolling and MT-32 soundtrack, both beautifully emulated via DosBox. Indeed, the jewel case copy gushes about the features: “Over 3 megabytes of graphics data; over 600 screens of actions! Smooth 15-level parallax scrolling…; Over 100 monsters, some larger than half the screen.” It makes me feel a bit short-changed since I couldn’t get much farther than the original screenshot poster. 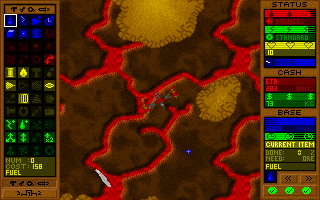 The game opens competently enough, with some good looking (for 1997) animations depicting a spaceship prospecting for minerals in an asteroid belt when a new alien threat attacks him. Some humans murmur ominously about this event and the game fast forwards by 10 years. This shows some recruits about to suit up for some space combat training. Unfortunately, this is when the game exhibits another characteristic that I recall was prevalent from the same gaming epoch: instability. Okay, so what happened is that I put the computer on auto-pilot, playing against itself. I was writing up the game’s description in TextPad. When the game got to level 2, I switched back to the game window. However, part of my text editor remained in the game’s window. That’s not the weird part. The weird part is that the cars seemed to be treating the text editor window as an impassable boundary! I think the behavior occurred as a result of the game window being obscured during a level change. Anyway, watch for 10K points soon. So the family got its first 8088-based PC in 1984. It had the CPU unit with dual 5-1/4″ floppy drives and no hard drive, keyboard, CGA monitor, and dot matrix printer. Quite the luxury for the timeframe. Aside from typing up the occasional book report, I wanted to play games! But those were sparse and the ones I had access to were played heavily. 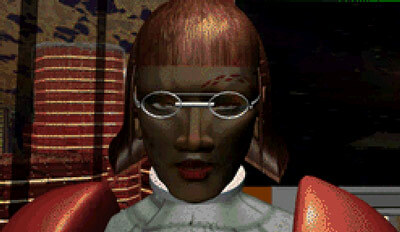 For some reason, all PCs at the time were equipped with GW-BASIC. I had in my possession a whole floppy disk full of games for this primitive language. I think there was more than one Pac-Man clone, but I can only remember one right now that must have been the least obnoxious of the bunch. 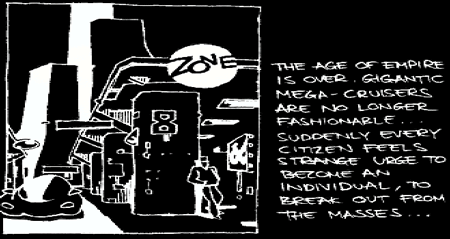 Looking back on it, the game must have run in an 80×25 cell text mode. I just remember it was very difficult. 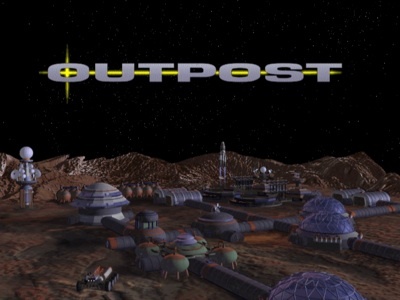 Another game that I distinctly recall is Outpost. In this game, you are stationed in a lonely outpost trying to hold down the fort against numerous ruthless advancing enemies. You have limited supplies but reinforcements randomly made it through. An overhead radar map was refreshed for every turn which updated the enemies’ positions (as well as your resupply unit’s position). If the resupply unit crossed paths with an enemy, well, you would have to spread your current stash a bit thinner. I believe there were various weapons that worked at different ranges and had different levels of effectiveness towards different enemies, whom I believe were identified by their toughness levels (1-5) on the overhead map. But the GW-BASIC game that I remember the most dealt with being on an island full of monsters. It was Escape From Monster Island, or perhaps just Monster Island. I remember the basic thrust: It was a text adventure where you moved from location to location and fought monsters of varying difficulty for numerous treasures. Some of the treasures were just unusual and for some reason, the only one that I can clearly remember is “XYZ monster is guarding a WANTON NAKED WOMAN”. The name of the treasure was always capitalized. Does anyone out there have any recollection of these games? Google sure doesn’t.